Android is a privilege separated operating system, i.e. each application in android is separated from another through a distinct id, and each application file / data is private to that application only. Each Android application is started in its own process thus are isolated from all other applications (even from system / default applications). As a result an Android application can’t access any file or data outside its scope until and unless the file or data is shared with the application. So, the conclusion is that if an application needs anything outside its scope, then it should request for permission to the user. Android comes with a set of predefined permissions (System permissions) for certain tasks. Every application can request required permissions. For example, an application may declare that it requires network access. It can also define new permissions. Now the question arises how an application can request for or get permission? Or rather, what workflow the developer should follow to request and get permission for the app? Let us have a look. The permission model / workflow has been changed from API 23 – Android M.
> Permission Model before M (API 23): Before API 23, the permission model was simpler to the developer but offered less control and security to the user – requested permissions are presented to the user before installing the application. The user needs to decide whether to give these permissions to the application and install it or to deny as a whole and don’t install the application. Permissions cannot be denied or granted after the installation. Thus developers were required only to declare all needed permissions in the manifest and then just forget; if the app is running then it has all the requested permissions. 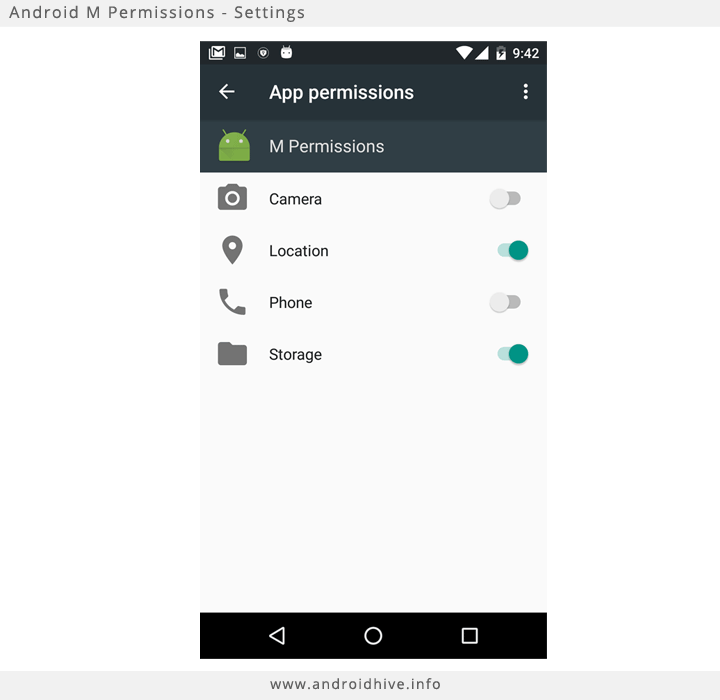 > Permission Model from M (API 23): With Android 6.0 Marshmallow (API 23), a new runtime permission model has been introduced. According to this model users are not prompted for permission at the time of installing the app, rather developers need to check for and request permission at runtime (i.e. before performing any action that may require the particular permission), users can then allow or deny the permission, users can also grant or revoke permission anytime from settings. Making the user experience very secure on an Android device. But inversely this feature imposes a great deal of effort on development. Therefore developers have to handle all the use cases. Thankfully, requesting Android runtime permissions, is not that difficult. Note: According to Google, beginning with Android 6.0 (API level 23), users can revoke permissions from any app at any time, even if the app targets a lower API level. You should test your app to verify that it behaves properly when it’s missing a needed permission, regardless of what API level your app targets. System permissions have different protection levels. The two most important protection levels are normal and dangerous permissions. Normal Permissions: Those permissions which will have very little or zero effect on users privacy or security are categorized as normal permissions. The system itself grants normal permissions when requested instead of prompting to the user. Examples would be ACCESS_WIFI_STATE, WAKE_LOCK etc. Dangerous Permissions: Those permissions which may have a greater effect on users privacy or security are categorized as dangerous permissions. Examples would be the ability to read the user’s contacts READ_CONTACTS. If an app requests a dangerous permission, the user has to explicitly grant the permission to the app. Here is the detailed information about permissions and their groups. So now let us start with creating a sample app. 3. Open build.gradle (app level) and make sure that you have set minSdkVersion and targetSdkVersion as we have to support the permissions model in lower versions also. I am keeping minSdkVersion to 17 and targetSdkVersion to 23. 4. Though we will request the permissions at runtime, we should add it to the Manifest also, so that the user will be prompted first time when going to use the permission, and then the system will remember user’s decision until user updates from the settings. We will start with the WRITE_EXTERNAL_STORAGE_PERMISSION. Add the storage permission to your AndroidManifest.xml just before the application tag. 5. Open the layout file of main activity (activity_main.xml) and add the below xml. This layout contains few buttons to test various permission scenarios. 6. Now open MainActivity.java and add the below code in FAB click event. //You already have the permission, just go ahead. > We checked for permission with checkSelfPermission() Method to check if the app already has permission to write on external storage. If it has then continue to else part, otherwise go to next step. > Here we used shouldShowRequestPermissionRationale() method to check if we should show the explanation for the permission or not, if this returns true then we showed an alert dialog with explanation, and on the positive button click we requested the permission. If shouldShowRequestPermissionRationale returns false then we requested permission straightforward. > We have successfully requested permission so far. We just need to override the method onRequestPermissionsResult to receive the result. In that method first we checked the requested code with our declared constant requestCode == EXTERNAL_STORAGE_PERMISSION_CONSTANT then checked if length of grantResult is greater than 0, so that it contains the user’s decision, then we cheked if the value of 0 index of the grant result, if the value is equal to PackageManager.PERMISSION_GRANTED then it means that the user has authorised the permission and we can continue our work, otherwise in the else part we can again request for permission with explanation. > Add SharedPreferences, think of a situation where the user has denied permission by checking “Never Ask Again”. In that scenario the shouldShowRequestPermissionRationale method will return false and requestPermissions method will do just nothing. So we need to remember whether we ave priorly requested for permission or not, even after the app restarts. For that purpose we will use SharedPreferences, we will use the permission string as the key and boolean true or false as value. 7. Create a new Activity and name it as MultiplePermissionsActivity.java. Open the layout file this activity (activity_multiple_permissions.xml) and add the below layout code. 8. Initialize btnLaunchMultiplePermission inside oncreate on MainActivity.java, and implement onClickListener to open MultiplePermissionsActivity on click. 9. Add the below permissions to AndroidManifest.xml file. 10. Open MultiplePermissionsActivity.java and modify the code as below. What we’ve done here is that created and string array with required permissions. While checking for permissions, checked by all elements of the array. The only exception is in while checking with SharedPreferences, here we’ve checked with only the first string, the reason is that for storing shared preferences on string is enough and only one shared preference can tell us whether we’ve already requested for permissions or not (as we are requesting for all permissions in one go). In the onRequestPermissionsResult() method we used a for loop to determine whether all permissions are granted or not. If a single permission is not granted then we will not proceed further. We will now move forward to requesting permission from Fragments. Now let us take a different approach. We will request for Phone State permission (we will actually do nothing with the permissions, we just ask for the permissions and will show the permission we’ve got). 11. Create a new Activity and name it as FragmentPermissionActivity.java. Fill the required details and check Use a Fragment. 12. Initialize btnLaunchPermissionFragment inside oncreate on MainActivity.java, and implement onClickListener to open FragmentPermissionActivity on click. 14. Open PermissionsFragment.java and modify the code as below. So everything here is almost same when you request for permission from fragment or activity, except for that you should not use ActivityCompat.requestPermissions when requesting from Fragment instead use the inbuilt method of fragment. I hope this article gave you very good overview of Marshmallow permission model. Feel free to ask any queries / doubts in comments section below. Although this article explains very well about Runtime Permissions, it’s still very tedious task implementing permissions and its needs lot of code. If you want to quickly add runtime permissions, consider using Dexter library. But I can see, In some apps like Snapchat, TubeMate all permissions including dangerous permissions are enabled by default even in Android M. How they are doing it ? Just change your target SDK to below 23 (say 22). As runtime permissions was introduced in Android M which has SDK int 23, any app which is targeting below this will automatically grant all the permissions. Google play will show you the dialog with all the requested permissions. But this method is not safe now because user can revoke permissions anytime from device Settings on Android M or above devices which can make those apps unstable. So, it’s better to check for permissions every time. Is there any other down sides on setting target SDK less than 23 ? At the least it will prevent annoying the users after installing the app. Anyhow, we’ll check for permission status in the code so, it will ask user to enable the permission only if user disables them manually. The main reason of runtime permissions was to grant only those permissions which users are actually using and when required. If all the permissions are necessary for your app, you can ask them in one go by using multiple permissions as explained above. Still, you can do experiments with your idea if it is working fine for you. Which software did you use to make the video? Thanks in advance. Hey this is the code someone gave you, right? The code is way too familiar. While I am trying to download your source code…Login with google isn’t working…why? I have to check. Have you tried other logins? Hi, it’s a good tutorial, but i need help, when i try onRequestPermissionsResult in my listview adapter, it is not being called. it is given me this error ” method does not override method from its superclass “. Implement this code in activity or fragment instead of doing it in adapter. Thanx for your reply, but i have buttons in my listview which need permission for write_external_storage, how is it possible in its parent activity ? Write an interface in adapter class and pass the click to parent activity. Here is a simple example. // In you activity implement the class from the interface and override the onButtonClick method. thank you…i will test it. I tried it, everything in adapter looks fine but when i implement it in my activity it says it Class must either be declared abstract or implement abstract method. Why you used onPostResume() here ? As of now no direct way. Could make a PreferenceFragment or PreferenceActivity to create that screen inside the app, then make that your Main and Launcher inside the Manifest. You can keep the permissions related code in a class and use it in other places. Yes, you have to check for the permissions in each and every activity. But it should only be in the activities where that permission operation is required? Right? I mean to say that only. Suppose in my project I am using Welcome Screen with animation. When animation ends then it will proceed to next activity. If I implement this permission code inside onStart method and animation codes inside “proceedAfterPermission()” method then application is working fine but animation never ends for the first time. i.e. next activity is not opening. I have to restart my application to open the next activity. The download button is there already at the beginning of the article. can tell me how to hide btn after permissions is granted? waste Still, you can do experiments with your idea if it is working fine for you. Nice artical cover all scenario I like your tutorial but I am wondering why you use onPostResume method? Can you explain me bit?? Everything is working fine for me but alert dialog is not dismissing by itself even after granting permissions? Screen overlay Detected in Android M.
no acticity to handle the intent?how to clear?